Are you a mobile phone hoarder? Are there other hoarders at work? 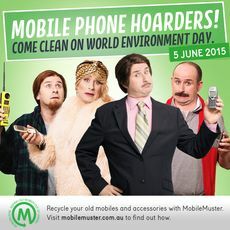 Our friends at MobileMuster are calling on you to come clean in time for World Environment Day on 5th June and become a recycling champion. There are valid reasons for keeping a back up mobile at home or in the office, but MobileMuster's research shows that many people have more than one unused phone tucked away in a draw or cupboard. How many back ups are really necessary? The forthcoming World Environment Day (5th June) is a great opportunity to break the hoarding habits of you and your colleagues. To get involved, all you need to do is find a recycling champion. It could be you, your manager, the CEO, the IT manager or the office-recycling guru (every office has one). Once you've successfully recruited your recycling champion all you need to do is take a photo of them with their unused mobile phone and have them include a comment on why they've been hoarding it. Then use this graphic for internal messages or on social media to encourage others to recycle. It's as simple as that! MobileMuster has developed a range of tools and promotional collateral including tips and life hacks on going e-waste free. You can get these resources by visiting the MobileMuster website, giving them a call on 1300 730 070 or emailing mobilemuster@amta.org.au.